It is with glowing pride and pleasure that I alert you to an upcoming performance of work by my dear friend Sydney Skybetter. It’s no accident that my tone is coming off as a bit mother of the bride – having been a part of his company, skybetter and associates, from its birth in an empty stairwell at the Tisch School of the Arts, it’s been really remarkable to see how the artistry of the repertory and the performances have grown. 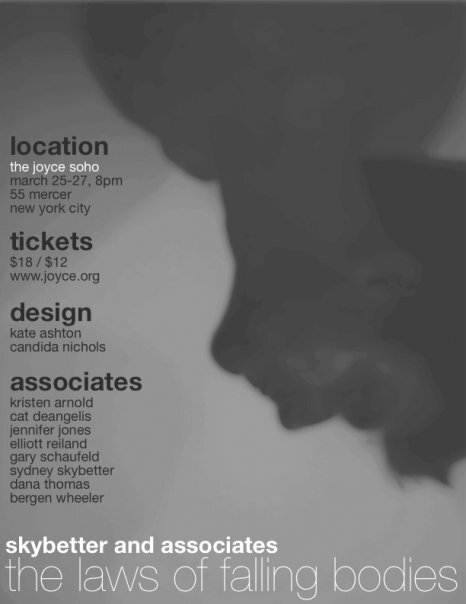 The performance next weekend at the Joyce Soho is the full evening debut of a really remarkable group of performers in a body of work that I find refreshing in its tender attention to craft and its calm, sensitive presentation of the dancing figure. The current state of Sydney’s craft is best seen in the newest addition to the repertory and the evening’s “title track” – “Laws of Falling Bodies,” a recent commission from Minneapolis’s Zenon Dance Company. Set to music by Jonny Greenwood, this septet represents both an increasing preference for the athletic over the stately and contemplative qualities that mark some of the earlier repertory, as well as a more profound and delicate sense of how formal patterns and anomalies communicate group dynamics. Having seen some remarkable footage of this piece in workshop stages I can only imagine that a final presentation with the New York group of dancers and design collaborators will be something really special. The evening features performances by Kristen Arnold, Cat DeAngelis, Jennifer Jones, Elliott Reiland, Gary Schaufeld, Dana Thomas, Bergen Wheeler, and Sydney himself, with lighting by Kate Ashton and costumes by Candida Nichols. Pertinent information regarding ticketing and attendance can be found on the poster below. Go!